The Denver Nuggets entered the Thursday’s draft with the highest of hopes. Unfortunately, the Nuggets have faltered in pressure situations in the past and that trend continued Thursday night. The Nuggets’ previous three drafts have yielded tremendous hope in potential franchise cornerstones Gary Harris, Emmanuel Mudiay, and Jamal Murray. The three, in addition to European sensation Nikola Jokic, have had the Nuggets brewing with optimism for years. Entering the 2017 Draft, Denver was expected to have a pool of promising talent to choose from with the 13th pick. Instead of drafting at 13, Denver opted to strike a deal with the Utah Jazz to acquire defensive forward Trey Lyles. At the time, the Lyles trade was a good look for the Nuggets; however, he turned out to be the scraps of what Denver had hoped would be a much more impactful night for the future of the franchise. The Nuggets had been murmured in trade talks for a big-name player. 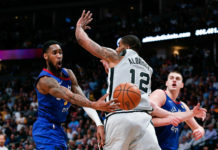 Thursday it seemed as if Denver was finally ready to make a play, but a failed deal for Jimmy Butler in the hours ahead of the draft set a bad tone for what would be a bad night. Another deal for the Suns’ Eric Bledsoe may still be in the works, but it failed to materialize on draft night. After a draft that left most fans with a sense of confusion, Tim Connelly took the podium. Connelly appeared dejected by the time he took the podium. 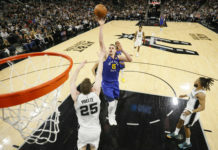 It was clear, the Nuggets took a chance at a big fish, and once again, came up short adding to the long list of failed attmepts to take that next step. Last offseason, Denver came close but no cigar to signing free agent Dwyane Wade. At the trade deadline last year, they couldn’t get a deal done despite making a big push for Paul George. Towards the end of the last season, the Nuggets were in the thick of the playoff hunt. When the trade deadline arrived, Denver move Jusuf Nurkic and a first round pick to division rival Portland in exchange for Mason Plumlee. 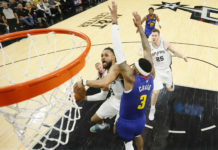 The trade would come back to haunt Denver as Portland would eventually eclipse the Nuggets in the standings and end their season at the hands of the newly revitalized Jusuf Nurkic and company. In addition, Portland just used the first round pick they received from Denver to trade up to No. 10 and swipe Zach Collins, a prospect the Nuggets had hopes would have fall to them at 13. 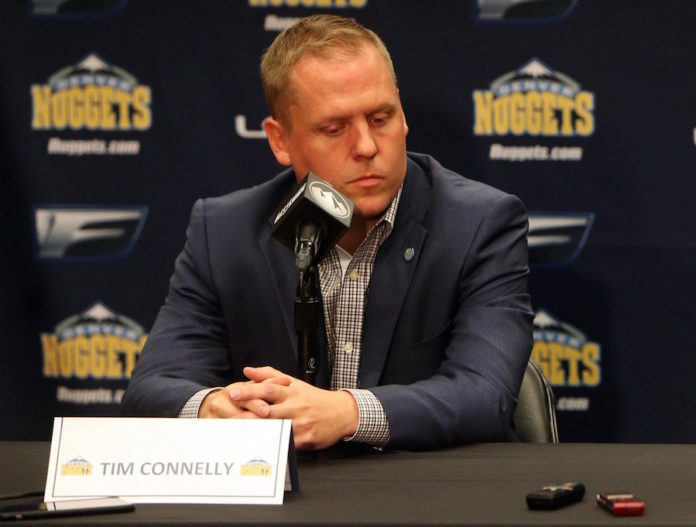 Compounding Denver’s troubles on draft night, former Nuggets GM Masai Ujiri swiped with the No. 23 pick another prospect Denver had been eyeing, OG Anunoby. A knee injury caused Anunoby to fall out of the lottery picks, but not fall enough to the Nuggets at 24. While president of basketball operations Tim Connelly vows that the front office is aggressive in their pursuit to build a championship-caliber team, he has so far proven unable to make the big move necessary to take the next step. Thursday’s draft was an opportunity for Denver to take a significant stride towards their goal, not just through the draft, but by using assets to acquire a star talent. Yes, acquiring star talent is difficult, but Thursday, the Nuggets had a chance to grab the bull by the horns and failed again. Thursday’s draft marked the first of what will be many defining moments for the franchise in the next 12 months. These moments, including the draft, the upcoming free agency period and next season’s trade deadline, are all opportunities for the Nuggets to finally make the big move that will get them back into the playoffs.